REDTalks celebrates exceptional ideas and performances from Indigenous artists, catalyzers, innovators and leaders. This Series inspires, informs and builds ongoing engagement with the broader communities regarding contemporary Indigenous arts and culture. Since 2011, REDTalks has been curated and hosted by award-winning arts innovator Sandra Laronde. REDTALK: "ISHPIMING: The Above World"
Our REDTalk Series celebrates exceptional ideas and performances. 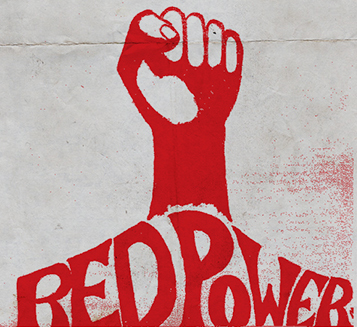 Join us for this exciting REDTalk after a performance of Red Sky's latest show Trace at Berkeley Street Theatre. Making its World Premiere at Canadian Stage's Berkeley Street Theatre, Trace is inspired by Indigenous cosmology and maps our Anishinaabe sky and star stories, offering an exciting glimpse into our origins and our future evolution. Join us for a fascinating discussion that takes us from the origins of life on Earth to the edge of the universe. For tens of thousands of years Indigenous peoples of Turtle Island have mapped the night sky, star systems, and space-time geometry, establishing an expansive view of the world and a body of scientific knowledge that has often been ignored and erased. 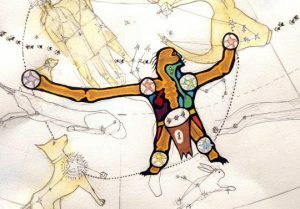 In this REDTalk, we explore multiple knowledge systems of cosmology and the many points of intersection between Indigenous cosmology and Western astronomy. REDTalks host and curator Sandra Laronde will be joined by cultural astronomers Wilfred Buck (Manitoba First Nations Science Education Resource Centre, Winnipeg) and Michael Wassegiizhig Price (Bemidji State University, Minnesota), astrophysicist Annette S. Lee (St. Cloud University, Minnesota), and astrobiologist Daniella M. Scalice (NASA, Maryland) as we investigate and discuss two bodies of knowledge systems that will be equally valued. Join us for a meet and greet at 6:30pm in the Toronto Room at the Verity Club (111e Queen Street East) followed by the REDTalk at 7pm. FUTURE FORWARD: Be part of our space odyssey as these themes will be further explored in Red Sky Performance’s world premiere of "Trace", a sumptuous new dance/live music production that explores Anishinaabe star and sky stories that map our origin and future evolution. ("Trace" will be performed from October 30 - November 11, 2018 at Canadian Stage). Wilfred Buck is a member of the Opaskwayak Cree Nation, currently employed with the MFNERC as a Science Facilitator. He obtained his B.Ed. & Post Bacc. from the University of Manitoba. As an educator Wilfred has had the opportunity and good fortune to travel to South and Central America as well as Europe and has met, shared with, and listened to Indigenous peoples from all over the world. He is a husband, father of four, son, uncle, brother, nephew, story-teller, mad scientist, teacher, singer, pipe-carrier, sweat lodge keeper, old person and sun dance leader. As a Science Facilitator with MFNERC, Wilfred was given the mandate to “put a First Nation perspective in the sciences”. The easiest way to go about doing this, he was told, was to look up. Annette S. Lee is an astrophysicist, artist and the Director of the Native Skywatchers (NSW) research and programming initiative. She has over 28 years of experience in education as a teacher, university instructor, educator, program administrator, professional visual artist, and researcher. Currently Annette is an Associate Professor of Astronomy & Physics at St. Cloud State University (SCSU), Director of the SCSU Planetarium, and an Indigenous STEM consultant for Fond du Lac Tribal & Community College. Annette is mixed-race Native American and her communities are Ojibwe and D(L)akota. Michael Waasegiizhig Price served as a faculty member in the Indigenous Studies Department at Bemidji State University and dedicated 16 years of service to tribal colleges in Minnesota as both a faculty member and administrator. Michael’s academic pursuits are Native American ethnobotany, Indigenous Astronomy and integrating Anishinaabe language and culture into the natural science curriculum. Michael earned a Master of Science in Forestry at the University of Montana and a Bachelor of Arts in Biology at Benedictine College in Atchison, Kansas. He is currently working on his teaching certificate in Anishinaabe language at Bemidji State University. Daniella M. Scalice has been the Education and Communications Lead at the NASA Astrobiology Program since 2001. In addition to leading and supporting the astrobiology community in its education and outreach efforts, she co-founded the NASA and the Navajo Nation project with her Diné colleagues in 2005. Now in its 14th year, the partnership brings together scientific and cultural knowledge into programs for Diné youth, supporting them to pursue STEM without compromising their cultural identity. We gratefully acknowledge the Department Canadian Heritage and the Ontario Arts Council for its generous support of the 2018-19 REDTalks Series. Cover Image: Biboonkeonini-Wintermaker, Close up from “Ojibwe Giizhig Anung Masinaaigan”, A. Lee, W. Wilson, C. Gawboy, 2012. A robust and extraordinary storyteller and culture keeper, Bea Shawanda (Odawa-Pottawattomi) is from the Manitoulin Islands. On April 24, Bea will share her experiences as an ex-student of the St. Joseph Residential School in Spanish, Ontario, contributing to creating a legacy of fortitude, hope, and resilience with First Nations and Canada. She is a frontline worker with over 35 years of experience in North America in health, education, social and family development as well as organizational leadership and multi-cultural training. Bea has commissioned books and developed curriculum on these subjects, and currently heads her own human resources development/leadership training organization. 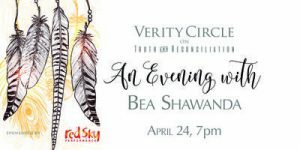 The Verity Circle on Truth & Reconciliation together with Red Sky Performance is thrilled to bring Bea to Verity members for an evening to remember. Celebrate the first day of Spring with us! It's the season kick-off of REDTalks. First up are two fearless, exciting, and unabashedly physical artists: Tanya Tagaq and Laakkuluk Williamson Bathory. One is a multi-award winning experimental Inuit throat singer and other is a trailblazing Greenlandic mask dancer. 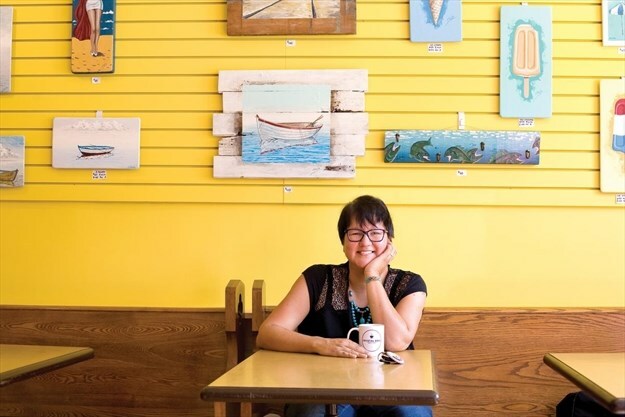 Hosted by Sandra Laronde, this intimate evening of dialogue that will look at the artists’ work through a lens of their Indigeneity, spanning Inuit culture from Canada to Greenland. Presented in collaboration with Canadian Stage. Berkeley Street Theatre at Canadian Stage, 26 Berkeley Street, Toronto. Space for this event is limited! Reserve in advance for $25 per ticket or Pay-What-You-Can at the door (subject to availability). BOOK ONLINE or call the box office at 416.368.3110 to reserve tickets now. Sandra Laronde, Artistic Director of Red Sky Performance, is an accomplished arts innovator and cultural leader. She has conceived, developed, produced, and disseminated award-winning productions that are Indigenous, multinational, multi and inter-disciplinary, and intergenerational in scope. She will speak about the concept/creative process behind Backbone as it relates to Indigenous Ways of Knowing. Cowboy Smithx is an award-winning filmmaker of Blackfoot Ancestry from the Piikani and Kainai tribes of Southern Alberta, Canada. Cowboy is the founder and curator of the highly acclaimed International Indigenous speaker series "REDx Talks." He also serves as the Artistic Director of the Iiniistsi Treaty Arts Society. 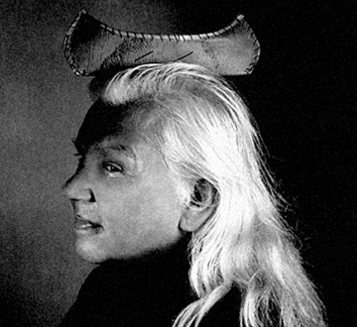 Gerald McMaster, is a curator, artist, author, and professor of Indigenous Visual Culture and Critical Curatorial Studies at OCAD University, Toronto. McMaster has curated two international biennales: in 1995, he was Canadian commissioner to the Biennale di Venezia; and in 2012 he was an Artistic Director of the 18th Biennale of Sydney. In 2018, he will be Curator for the Canadian Pavilion at the Venice Biennale of Architecture. REDTalks featured Supaman, a hip-hop artist from the Apsaalooke (Crow) Nation in Montana who brings an explosive mix of fancy dance, music, and spoken word to his shows. Known for his motivational lyrics and work with Indigenous youth, Supaman has built a career entertaining young people across North America. Our REDTalk included a short performance, dialogue, and a mix + mingle. RED Talks presented an evening with Duke Redbird and the Red Power Movement, a highly mobilized and vibrant initiative that highlighted issues through social protest in the 1960's and 70's. Poet, scholar, storyteller and television personality Duke Redbird is a member of the Saugeen First Nation and Ontario College of Art & Design's (OCAD) first Aboriginal Advisor/Mentor. He is the author of a collection of poetry and has been published in numerous anthologies in Canada and the United States. REDTalks featured Jock Soto and Water Flowing Together, a compelling, intimate portrait of one of the most recognized and influential modern ballet dancers in the world. Of Navajo heritage, Soto was just 16 when George Balanchine selected him to join the New York City Ballet where he eventually became the most choreographed dancer in the company's history. Soto danced featured roles by George Balanchine, Peter Martins, Jerome Robbins and Christopher Weldon that had often been created for him. While Jock Soto is an artist who found his medium of expression in dance, the film explores more than Soto's career- it is as much about the complexities of the man, about heritage, identity and transition. Water Flowing Together, a film by Gwendolen Cates. 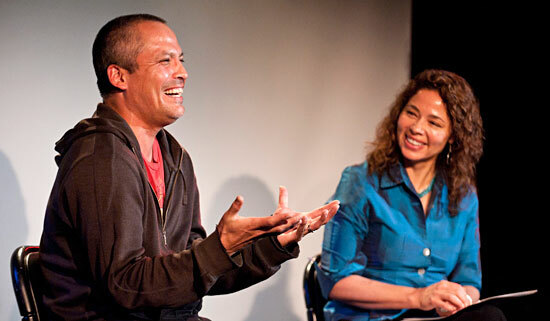 Red Sky presented an evening with acclaimed dancer Jock Soto who read from his intimate memoir Every Step You Take. Jock Soto was just 16 when George Balanchine selected him to join the New York City Ballet company where he eventually became the most choreographed dancer in the company's history. A principal dancer, his 24-year career included featured roles in over 40 ballets that were created for him by Peter Martins, Jerome Robbins, Christopher Wheeldon and Lynne Taylor-Corbett. He read from his memoir and joined Artistic Director Sandra Laronde in an up close and personal conversation. A book signing followed the event. REDTalks presented a special evening with Latin Grammy Award winning musician Alex Cuba and New York City-based dancer and choreographer Javier Dzul. ALEX CUBA: With a heart as big as his retro 'fro', Alex Cuba's trademark sugarcane-sweet melodies, pop-soul hooks and rock chords cut through cultural barriers like a machete through sugarcane. He won a Latin Grammy Award in 2010 for Best New Artist and was nominated for Best Latin Pop album at the 2011 Grammy Awards. 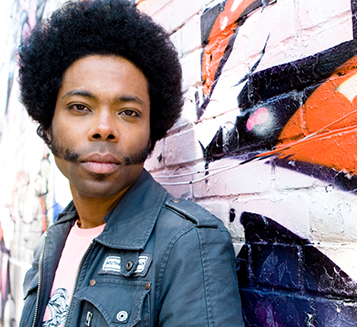 Listen to the music of Alex Cuba. JAVIER DZUL: New York City-based Javier Dzul fuses Indigenous pre-Hispanic ritual and mythology in dance with the undulant muscularity of a jaguar.